This is incredibly simple. 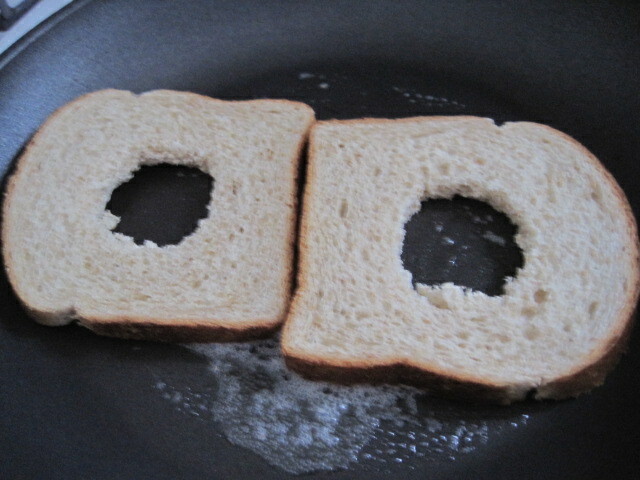 I just copied what Shek did and cut holes in the middle of two pieces of bread. 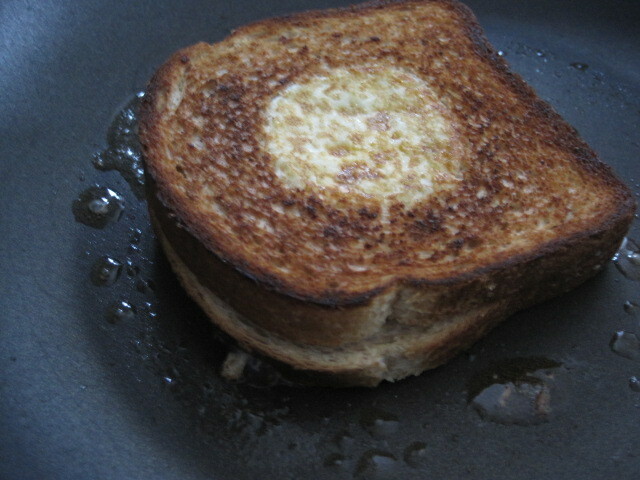 I heated up the frying pan, put in two pats of butter, and waited for the first sides to toast. Then, I flipped both slices over, but combined them into 1 stack. The eggs I have are grade A large brown eggs. I figured 1 egg would be too much for my thin slices of bread. 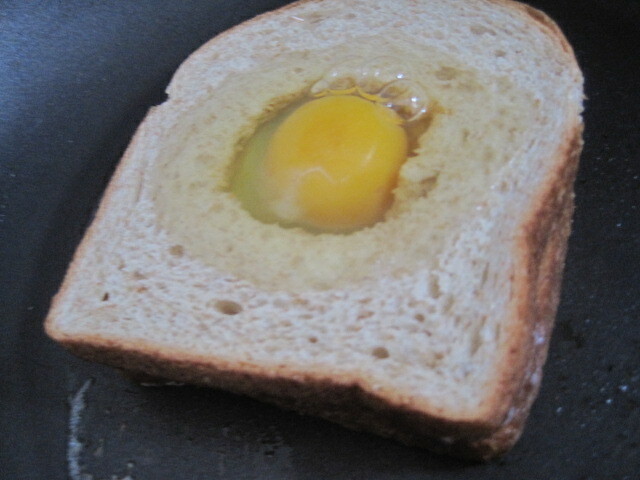 After the egg cooked a little, I then flipped it over and voila, I burnt the toast a bit. 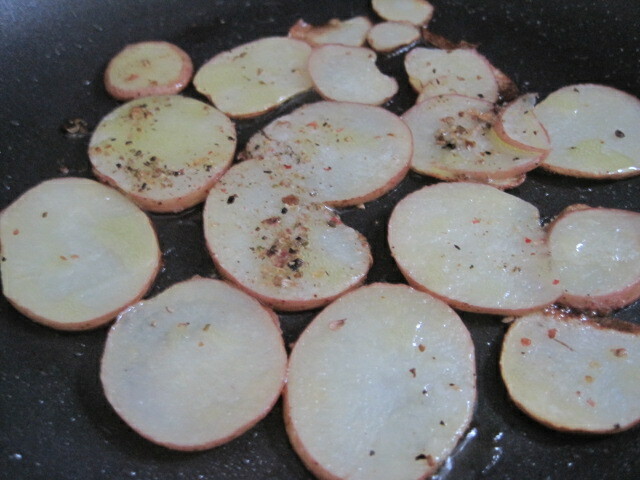 After that, I quickly sliced up small red potatoes, drizzled extra virgin olive oil, and sprinkled salt/pepper. I waited a few minutes and flipped them over. 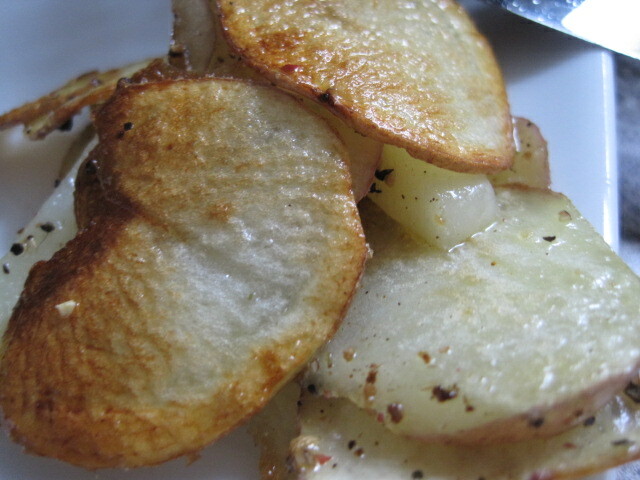 I didn’t cook them for too long because I didn’t want them to get too crispy. 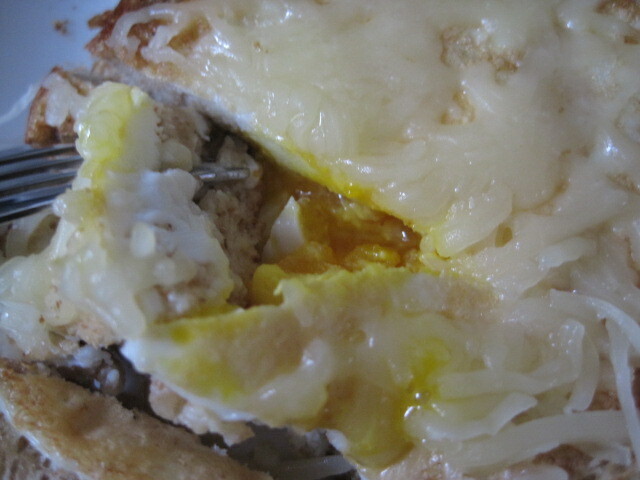 Here’s a close-up of my “egg in a basket”. I topped it off with some grated mozzarella cheese. Oh! 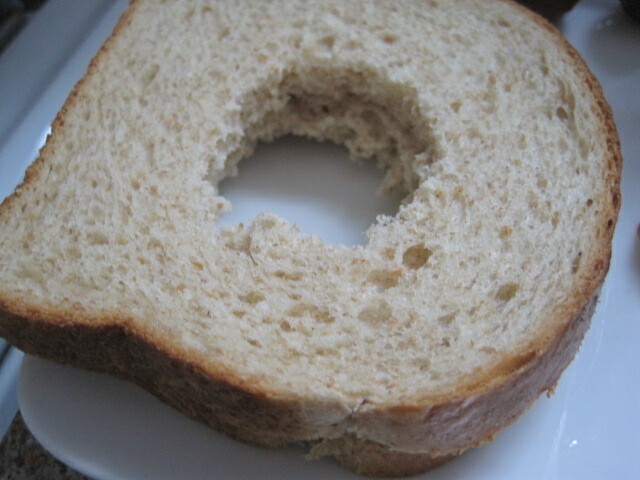 And I used wheat bread. It was pretty yummy. Excuse my red thumb in the picture, I was trying to hold it up to the kitchen window for the best light! 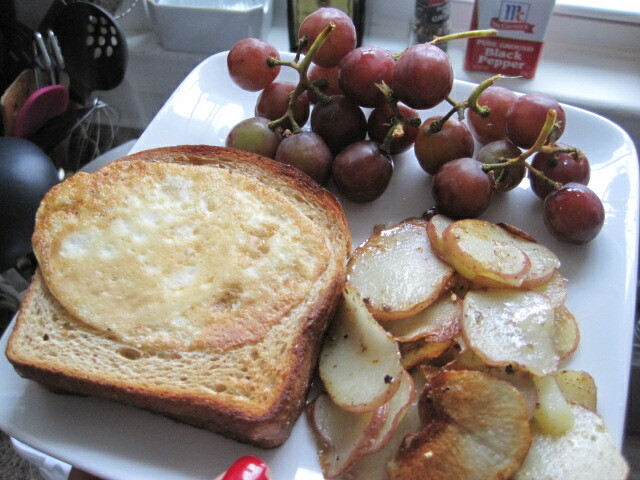 Just showing off my breakfast plate which took only a few minutes… egg in a basket, fried red potatoes and fresh red seedless grapes. Yum! Okay, I’ll admit it. 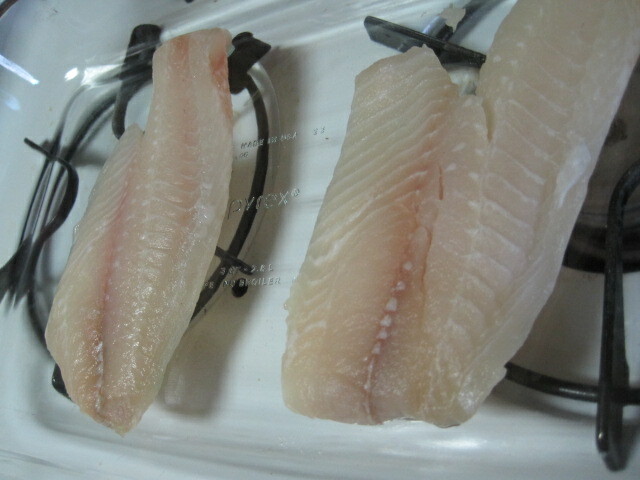 I am afraid of cooking fish. I just don’t know how! Er, at least I thought I didn’t. Woohoo for food52. I don’t remember how I got this website, but it’s fabulous. 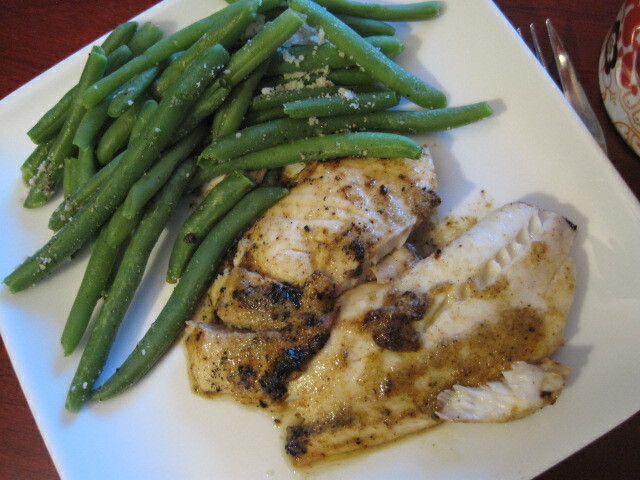 Okay, the Tilapia fish is the first and only recipe I’ve tried so far, but it was a success! 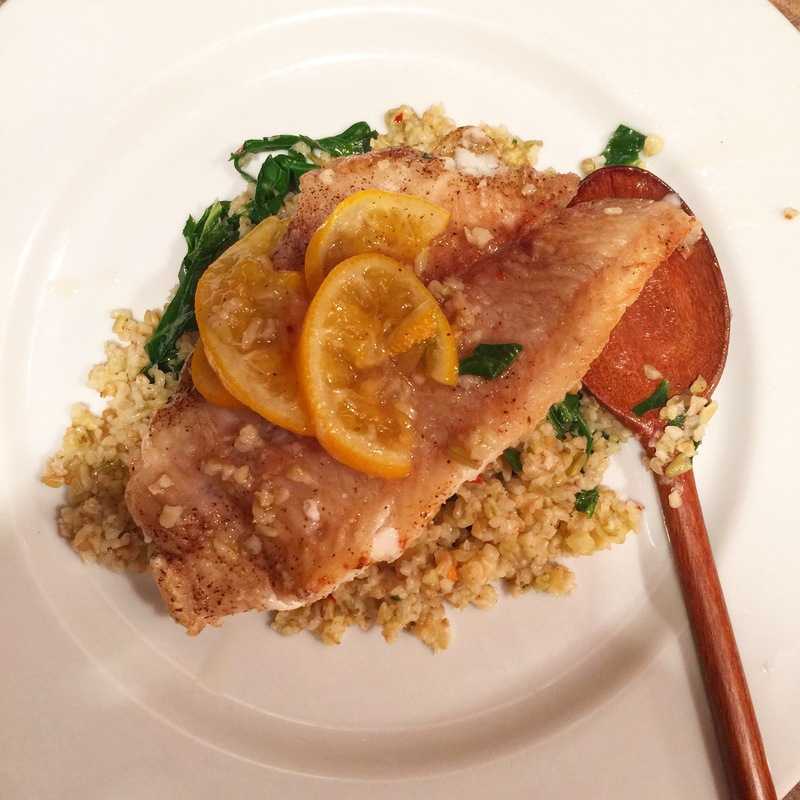 Fish is SO easy to cook. 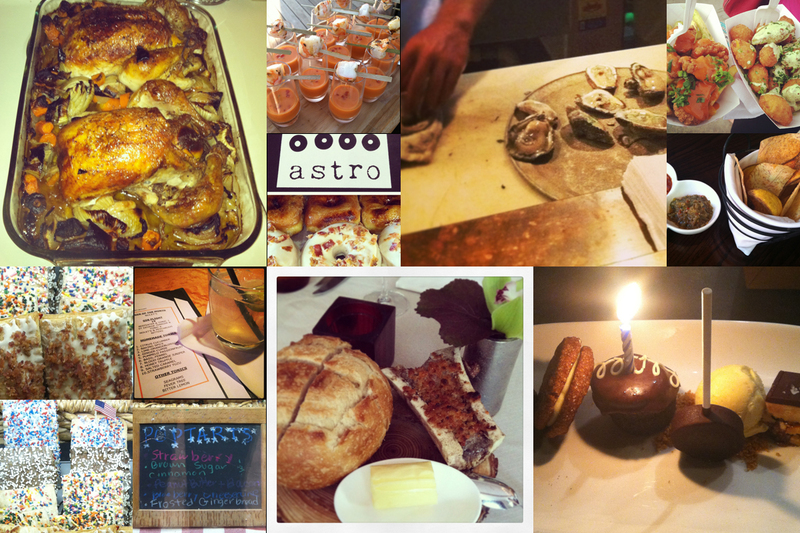 I’m thinking this will be great for the next 5 weeks considering I hate putting in time to cook with school+work. Le sigh. Awesome! It turned out fabulous. The ingredients? I put a little less of some things, and it still turned out good. Laid the two fillets in a glass casserole dish, poured the mixture over both, popped it in the preheated 425 degree oven, and baked for 10-15 minutes. So, just trying to keep up my regular schedule by waking up early in the morning. 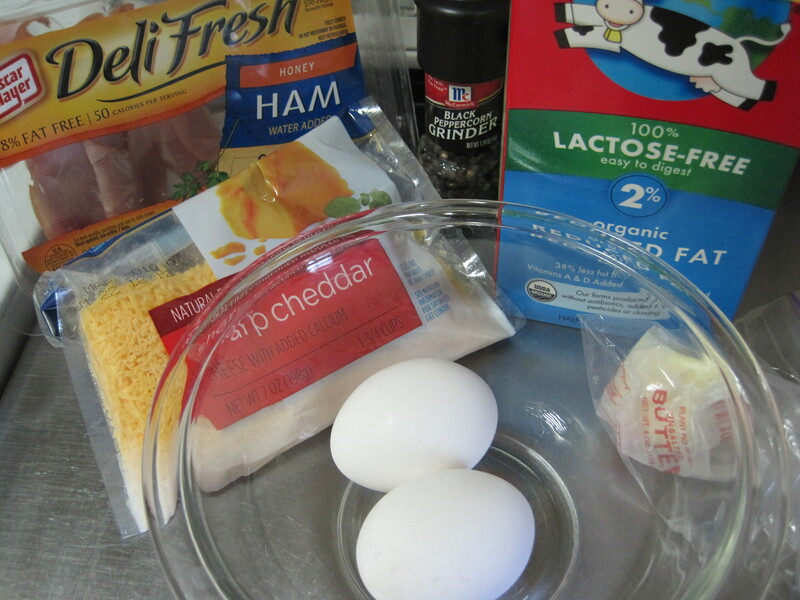 I gathered 2 large eggs, 2% lactose-free milk, thinly sliced deli ham, sharp cheddar, and unsalted butter. 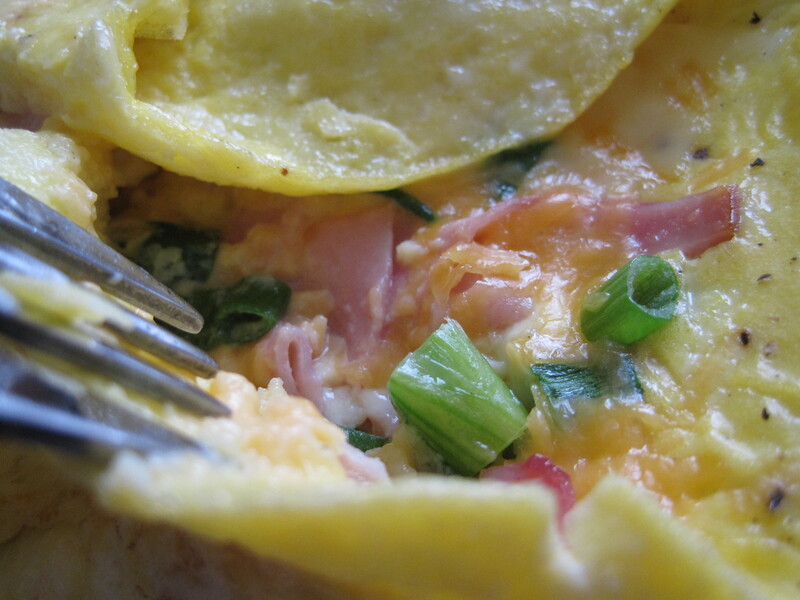 And VOILÁ, converted everything into a really good omelet. I should have cooked the ham first and then add the egg/milk mixture, but did it the other way around. It still came out good. Oh! Also, I added chopped spring onions. I didn’t add any salt because of the ham and cheese. 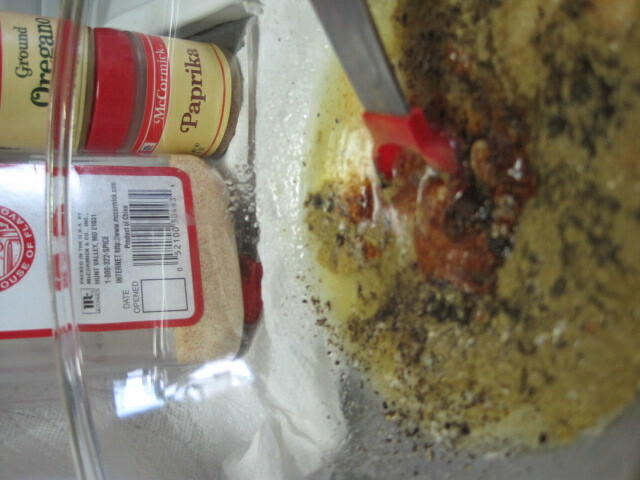 I did add some freshly ground pepper though. Sliced bananas and blueberry wheat waffle with syrup completed the plate. The mug is full of warm milk and english breakfast tea (no sugar/honey). 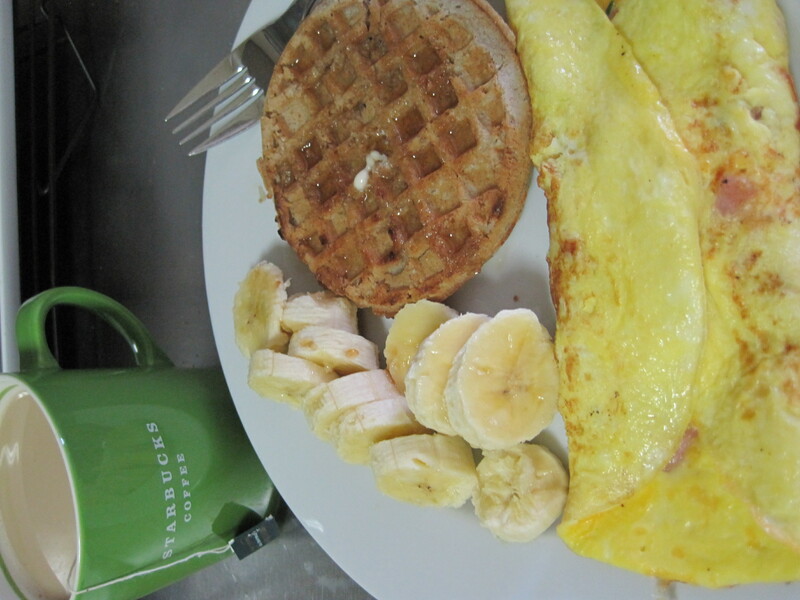 Usually, I mess up on omelets, but this time it came out really good! Every time I try to make kimchi bokkeumbap (fried rice) it doesn’t turn out that great. 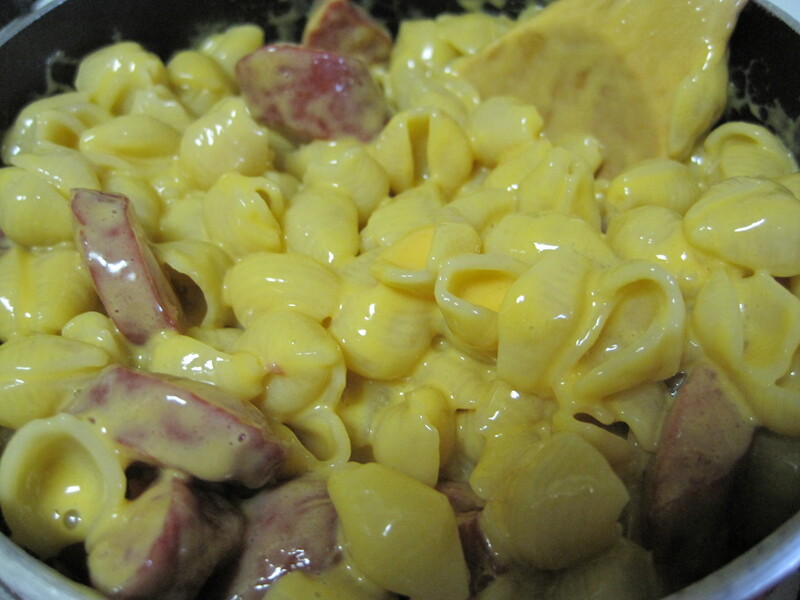 This time I took caution in my recipe and the process of cooking it. I let the beef marinade for a few hours and I set the rice in the cooker. 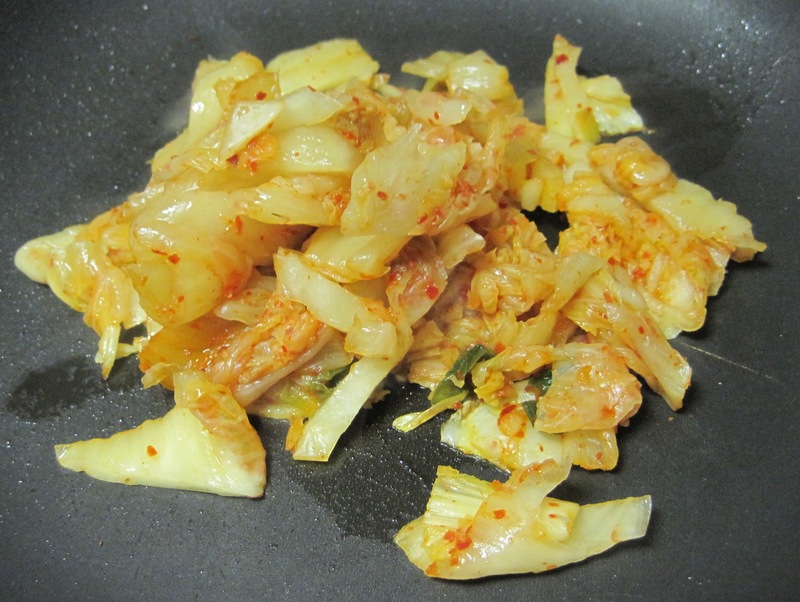 After the marinade, I chopped up more spring onions (scallions) and kimchi. Sesame oil in the pan and added the chopped kimchi and marinated beef. 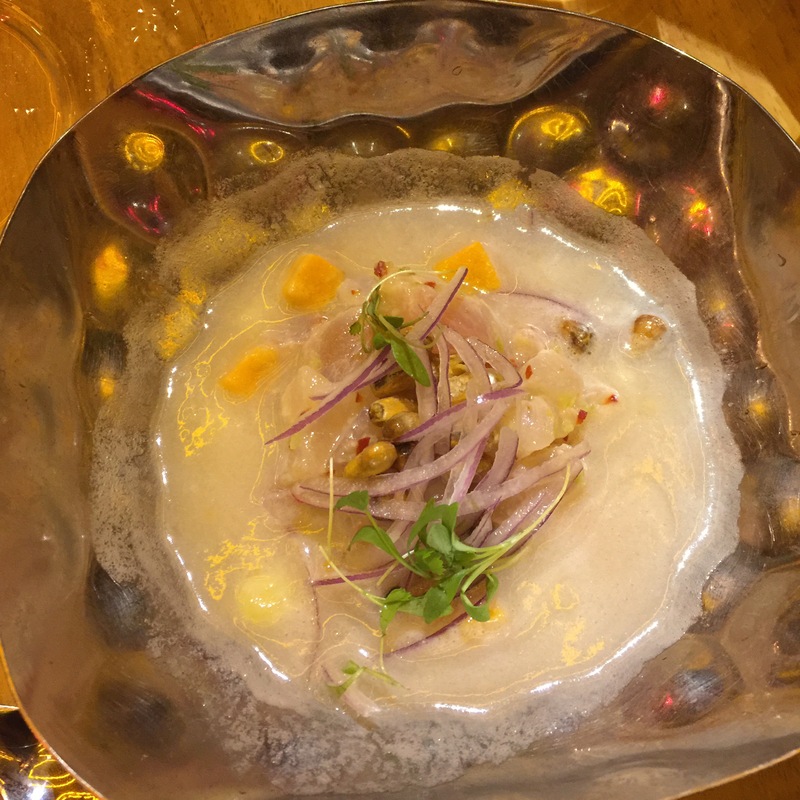 Set some of the sticky rice in a glass bowl to cool a little. After the beef was mostly cooked, I added and folded in the sticky rice, making sure everything was mixed. I admit I ended up adding a little more kimchi and a dash more of sesame oil. 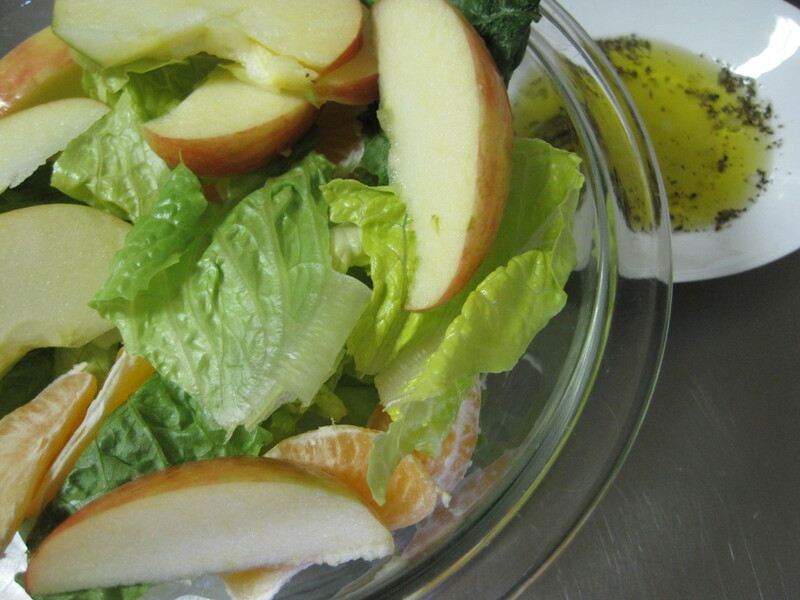 I also sprinkled a little rice vinegar in. 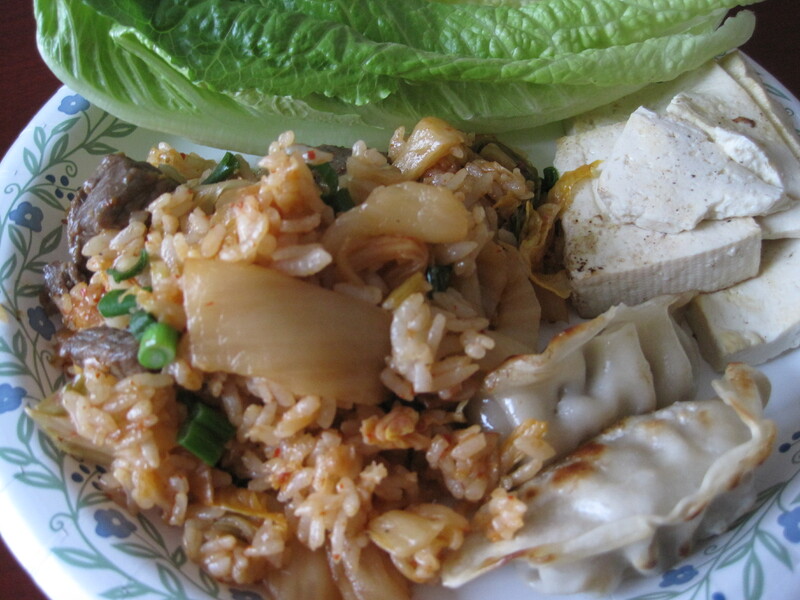 Kimchi bokkeumbap, mandoo (fried dumplings), and tofu with Romaine hearts. 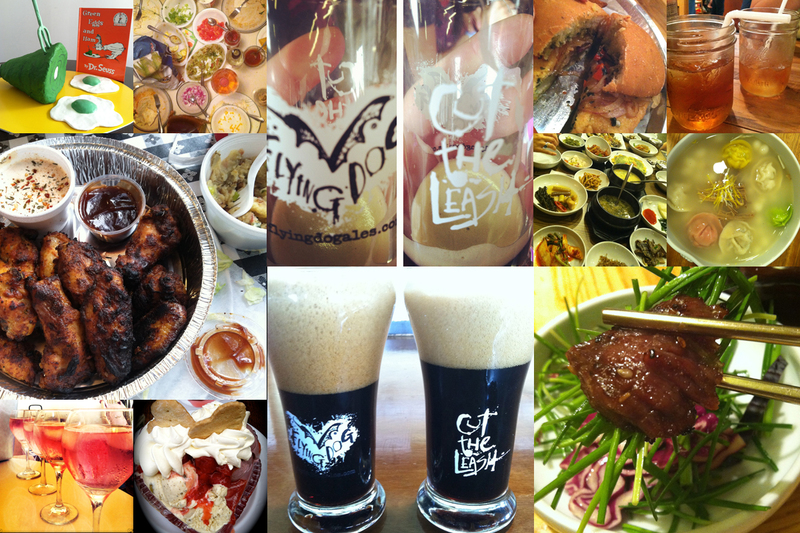 Everything was really simple, but still delicious. Sunday was the third day of being “snowed-in” from DC’s Snowpocalypse of 2010. I’m debating whether I should venture out today. I don’t need groceries (although, I ran out of milk yesterday). I could make tea at home. I can’t play today because I have an annotated bibliography due at 5:30pm via email. I may venture to my roof to check the damage and take some lovely photos. 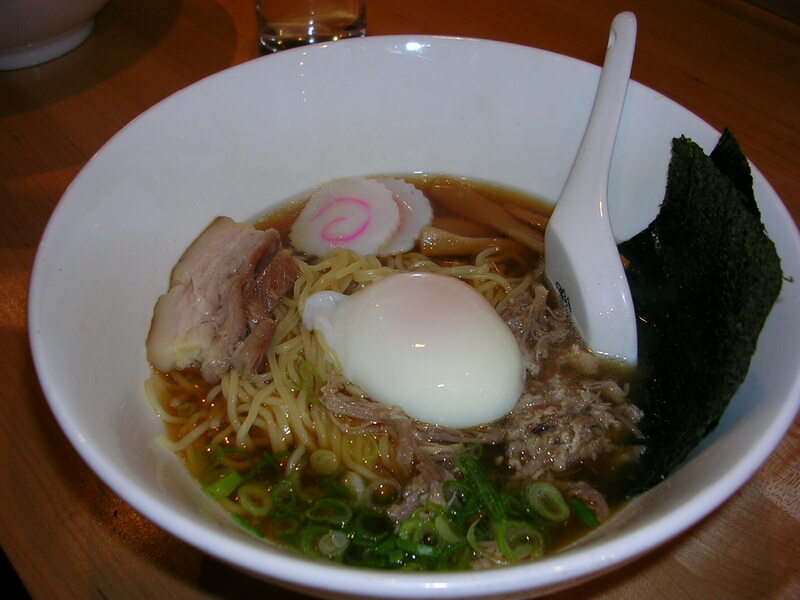 Ramen (ラーメン, rāmen?, IPA: [ɽaꜜːmeɴ] ( listen)) is a Japanese noodle dish that originated in China. It is served in a meat- or fish-based broth, often flavored with soy sauce or miso, and uses toppings such as sliced pork (チャーシュー, chāshū? ), dried seaweed (海苔, nori? ), kamaboko, green onions and even corn. Almost every locality in Japan has its own variation of ramen, from the tonkotsu ramen of Kyūshū to the miso ramen of Hokkaidō. Now, this has become a trendy thing in New York and I’m assuming in LA and San Francisco as well. How is ramen trendy?? I’ll show you. This is not the kind of ramen that comes in a package and “just add boiling water”, here’s your instant meal. No. 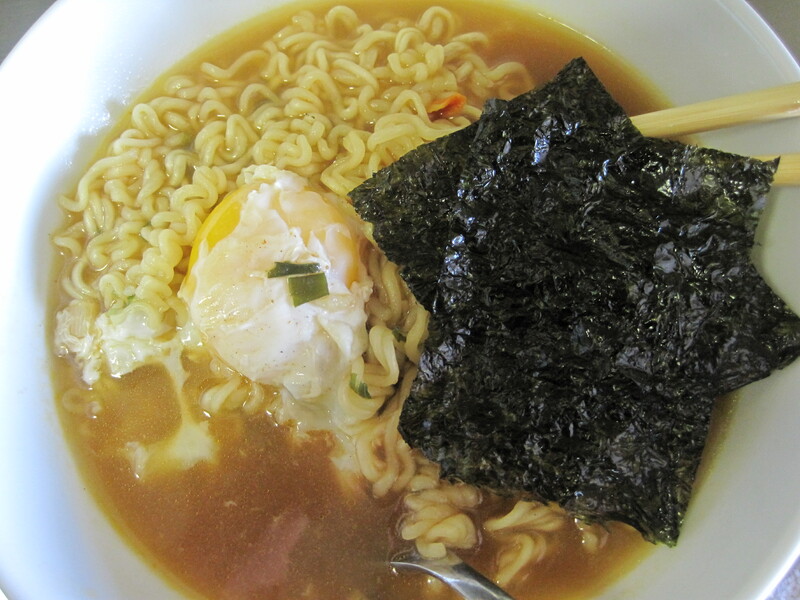 This is a real dish of ramen noodles in hot broth, pork, scallions, seaweed, and poached egg. Deliciousness for JUST under $20 at Momofuku in NYC. From what I hear, there are other ramen noodle bars and better ones in NYC, but this was pretty tasty when I went in 2008. In South Korea, instant noodles are more common than non-instant ramen noodles, so the word ramyeon (라면), cognate with Japanese ramen, generally means the instant kind. Ramyeon is typically spicy. Shin Ramyun (신[辛], literally “spicy”) is the bestselling brand in Korea. It has also become popular in China and the United States. 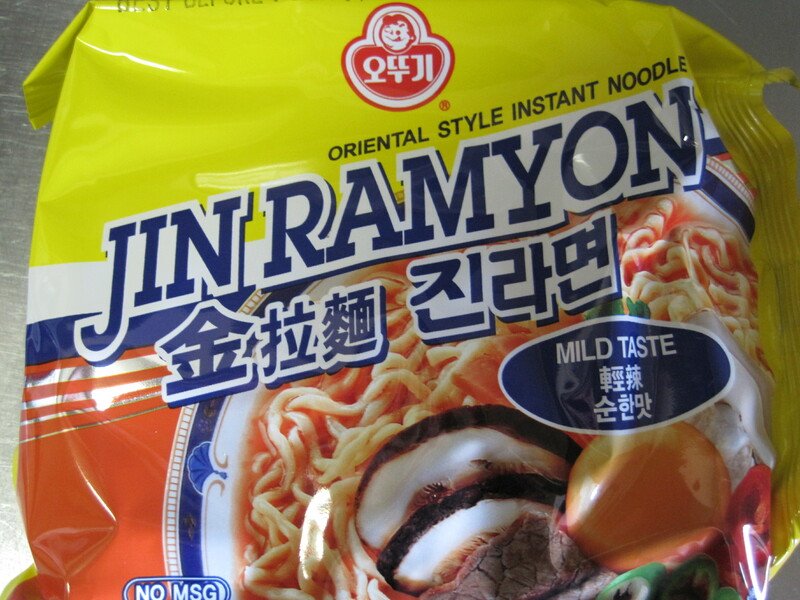 The leading manufacturer of ramyeon in Korea is the Nong Shim company, which exports many of its products overseas. In the 1960s, instant ramen was introduced to South Korea from Japan, and its quick and easy preparation, as well as its cheap price, made it soon catch on. Most South Korean food stalls make instant ramyeon and add toppings for their customers. 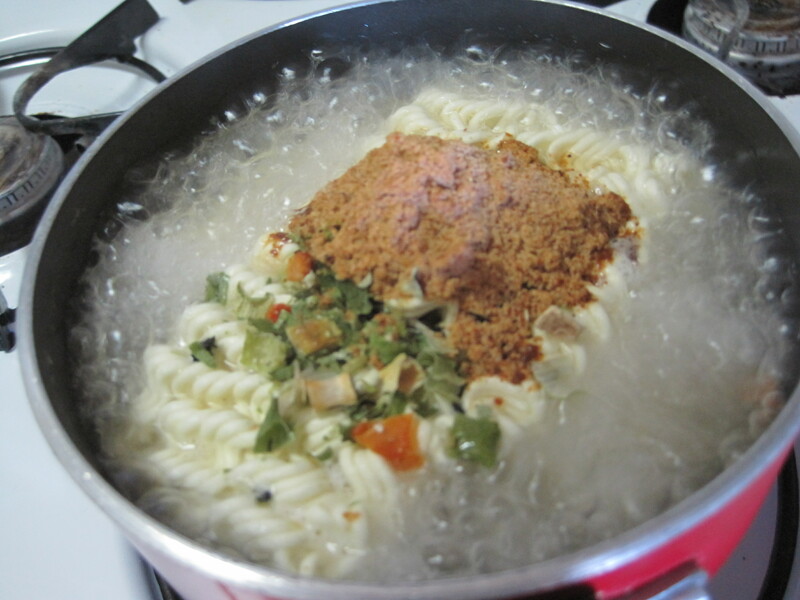 Instant ramyeon also tends to be added to budae jjigae (literally “army base stew”), a stew made with assorted ingredients which was invented in the 1950s in the vicinity of U.S. military camps stationed in South Korea. Ta da! Ramyon with poached egg and dried seaweed. Pretty good. If I had scallions and mushrooms, I would add those in. Mm, did you know there’s a Ramen Noodle Bar opening up on 7th Street downtown near the National Mall? Yup, it’s set to open this year: WAGAMAMA. I can’t wait! In the meantime, anyone want to hit up Annandale for some budaejjigae? I think this concludes my entries for being snowed-in. I believe my next entry will be about V-day cookies (for work). Stay hungry for more! Made milk tea with Assam Superb this time. 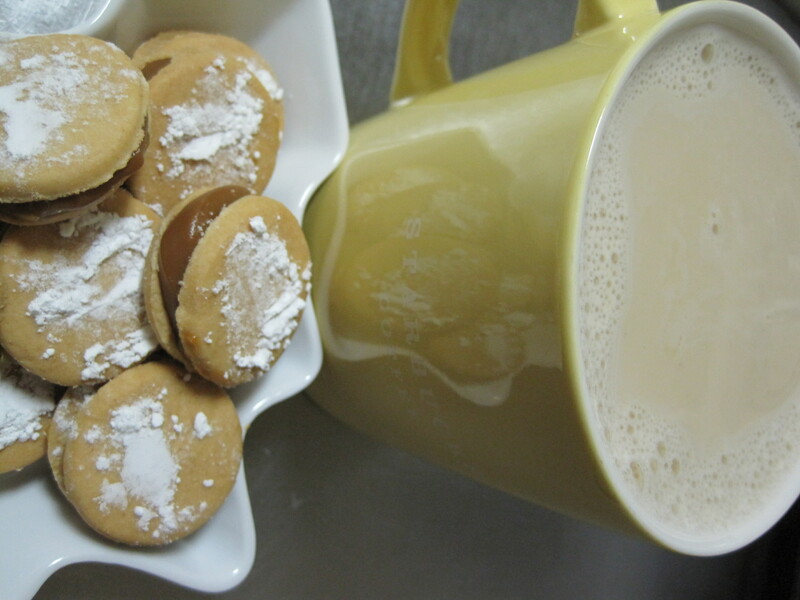 And finished off making the rest of my do-it-yourself alfajores. 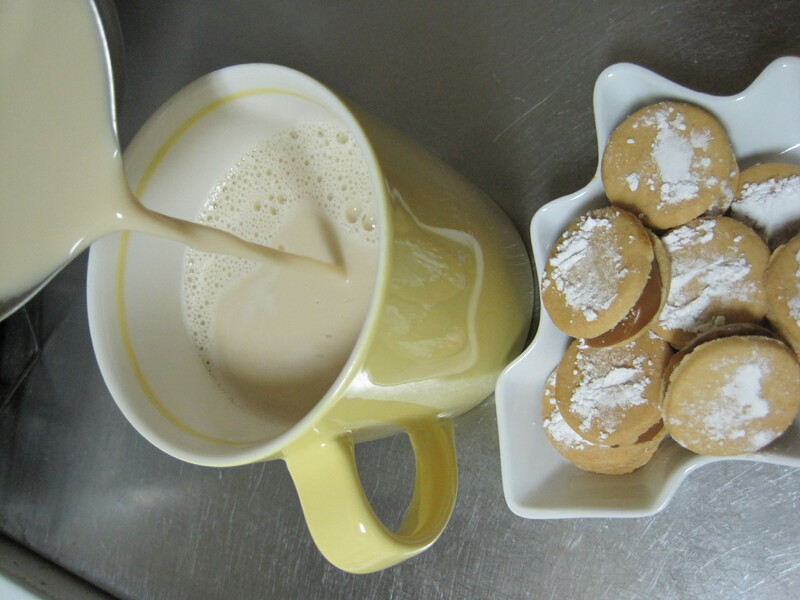 Milk tea and cookies were great for the first night of being snowed in. 🙂 yum.